If you have recently been injured in an accident in Boca Raton, there are many different things crossing your mind and it is likely that you may be feeling overwhelmed. It can be difficult to cope with the fact that your life has been dramatically changed by an accident. In fact, you may not even realize the full extent of your injuries until hours, days or even weeks after the accident has occurred. You may be assuming that you will be able to bounce back quickly and return to normal daily activities such as going to work. However, if your accident injuries are severe enough, you may not be able to recover well enough to go back to work at least in the immediate short term. Going back into your place of employment sooner than you are ready could actually put you at greater risk of re-injuring yourself or making it more difficult for your injury to heal. Of course, this depends specifically on the advice you have received from your doctors, but this highlights why it is so important to develop a treatment plan that is aligned with your individual needs. Given that each person may adjust to life after an accident differently, you need to consider these questions before thinking about whether it’s time to go back to work. Does It Mean That I Am Okay If I Return to Work? Returning to work does not necessarily mean that you have recovered fully or that your symptoms or injuries have completely disappeared. For example, you might return to work out of the financial necessity of needing to support yourself and pay these medical bills. Many people try to return to work after an accident and put all of their energy into their job. This can lead to other aspects of their life suffering and putting them at greater risk of being severely injured all over again. If you don’t allow yourself the proper time to heal, you could be putting yourself in a potential situation of struggling to ever fully recover. Will I Ruin a Lawsuit If I Go Back to Work? Many people might have the perspective that their legal case, as a far as a personal injury claim in Boca Raton, is immediately over if they return to work. You might be under the impression that returning to work signifies to the other side that you have recovered well enough to be able to go back to work and that your injuries are not severe. However, for many individuals this is simply not true. Plaintiffs who have a personal injury claim have a duty to mitigate damages, but they also must take reasonable steps to minimize losses. Missing time unreasonably from work can actually do more harm for your personal injury claim than good. You need to wait for an appropriate amount of time before your doctor says that it is safe for you to consider returning to work, but you should not simply stay out of work because you are under the impression that it will damage your personal injury claim. You need to consult with both your attorney and your doctor to determine what is best for you. Has My Doctor Told Me That I Can Work? In order for a claim of economic losses to be successful, you must be able to show that there is a medical basis for your inability to return to work after a Boca Raton car accident. 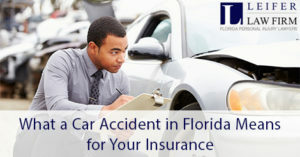 Being involved in an accident alone does not automatically entitle you to receive compensation from your insurance company or from another third party, if your medical bills exceed the personal injury protection cap in Florida. In order to illustrate this medical basis, you need to show the significance of your injuries and that these were tied to an accident in which the defendant had a duty of care which he or she breached, thus causing you these severe injuries. One of the most important things you can do to protect yourself is not only monitoring your own medical situation but also hiring an experienced Boca Raton personal injury lawyer as soon as possible to protect your rights. You may be eligible to recover compensation in a successful legal claim, but it is strongly recommended that you have someone advocating for your rights from the onset of your claim. There is simply too much on the line for your future to leave this matter up to chance. Consult with a lawyer immediately in order to best protect yourself. Asking these critical questions before returning to work could allow you to have the highest possible chance of a successful recovery and also allow you to stay involved with your personal injury claim in Boca Raton. Reach out to a lawyer today to learn more.